It seems that in the next few years (before OLED TV prices hopefully drop to a comparable level to LCDs), people wanting to buy a premium TV will have two options: 4K LCDs or FHD OLED TVs. 4K resolutions usually means 3840 × 2160 (although some offer different resolutions) - or about 4 times the pixels of FHD resolution, hence the 4K name. Obviously this makes sense. The higher pixel density means smoother images. But does it really make sense? There are two main issues here: suitable content and whether you can actually tell the difference. According to DisplayMate, if your TV is smaller than 80" or so in size, and you are watching from a normal distance (i.e. not really close), it is simply impossible to view a single pixel in a Full-HD TV (your FHD TV is already a "Retina Display" if you want). This means that you won't actually perceive the difference between 4K and FHD in a 55" TV in your living room. So while 4K may be relevant for the cinema or huge screens, it won't be any good at home. Many reviewers claim that the images look better - perhaps they are looking up close or perhaps this is just wishful thinking? Another important issue is the content. Currently there is very little (if any) 4K content available. Some manufactures are starting to produce 4K cameras (it is rumored that the Galaxy Note 3 will include a 4K video mode), but this is just the beginning. It's likely that 4K's fate will be like the fate of the 3D TV - very little content as it is not very attractive to begin with, even though most TVs will adopt the technolog. In addition, 4K content will quadruple the storage requirements which is annoying - you'll need more discs, a larger disk and a larger dropbox account. Is that just another consumerism conspiracy, trying to get us to upgrade our hardware to accommodate for content quality we cannot actually perceive? Of course 4K TV makers say that their TVs can upscale FHD content to 4K. Using smart algorithms it may be possible to make a FHD image look somewhat better in 4K. But as we said before you will not be able to spot the difference anyway at home, so what's the point actually of all this? The benefits of OLED TVs on the other hand are crystal clear - like the image quality of those TVs. Better contrast (deeper blacks), fast refresh rate, great color gamut, new form factors and eventually the technology will enable flexible displays and cheap production via printing as well. I think OLEDs win hands down over 4K. I'm not objective though, am I? 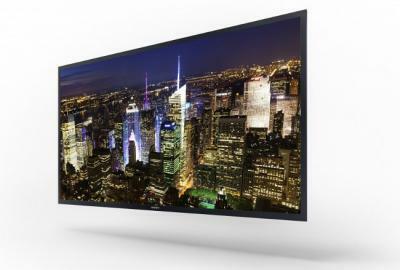 Of course it is highly likely that we'll soon see 4K OLEDs enter the market. This will render this entire debate moot. But still I think people should understand what 4K really means and whether it makes sense for them. You're obviusly biased because you are an OLED supporting website so your discussion is invalid. Yes, I am biased and not objective. But I do quote an objective source (Displaymate). I am also biaised too. Then I ll add that 4K broadcasting will need some time (and for sure enough time to decrease the price of the 4K TV sets): It would be like buying a HDTV for watching videotapes !!! For today, OLED TVs are available and should touch the people willing to buy 4K TV for better image quality. I cannot begin to describe how it saddens me that you can't see the benefits of 4k over 1080p. People who work with text (reading and creating documents, code writing) are one of the groups who benefit enormously from higher resolution. The eye gets less strain from reading because it doesn't have to adjust constantly to reading pixelated and, thus, unclear text. 4k has a huge advantages in terms of health because of that, nevermind its uses for graphics artists, video makers etc. Comparing 4k to 3d technology like you just did just shows your ignorance, but writing an article about it is even worse. You are clueless about the range of advantages that 4k offers. And btw, 4k and OLED are NOT mutually exclusive technologies, they are complementary, precisely because they are totally different things. 4k is about display detail, OLED is about what an actualy display is made of. 3d is yet another aspect, totally different than 4k and OLED. 3 different technologies that can actually work together in the same display. So be well aware of that when you write an article about these techs. The idea is not about being useful or not. And noone said 4K has no applications. And noone said said those technologies are not compatible. The topic was which technology will come first in the TV market as long as no product combining several of these technologies exists on the TV market. TV and displays are 2 different markets with different features and customers. And the idea I think is, as representative TV customer, for comparable price, I would rather buy an expensive TV which gives me a better image quality today rather than an expensive TV which will give me a better image quality in 3 years. If you were reading these articles for both their technological and marketing informations, you would understand that if you don t get the market, big Korean companies will not invest on bigger tools to drop down the prices and noone will buy either OLED or 4K TV. And if noone buys it, then it ll stay in the lab. The customer is always the king, the TV typical customers are your kids watching the Simpsons and your wife watching The Young and the Restless. If they want to spend money to upgrade their TV sets, they want results now, and that's normal. Why is this being framed as 4K vs OLED? When OLED can be made to do 4K just like any other display technology? And of course will do it better than any other, as it already does with HD? Hello. Perhaps you need to re-read my article. First of all, I did say that 4K is possible with OLEDs of course. But for the near future these are two competing technologies for the premium TV market. Second, according to display experts, you can't actually tell the difference between FHD and 4K in a TV. Of course for people using computer monitors this is different as you are sitting very close to the monitor. And then high-resolution monitors are already available and this is useful. Yes, thsi is true. Sony and Panasonic alraedy showed 4K OLED prototypes and LGD did say a while back the are working on 4K OLEDs too. But currently these aren't on the market. I'm not sure if 4K OLED will be better than FHD OLED, as I said, because technically you can't really tell the difference unless you watch really close (or you have a large, 80" TV). I don't think you are looking deep enough into this. Not eveyone uses their TV the same as you do. Some people like myself have never connected their tv to the decoder. I use my 46" FHD TV connected to my computer and I always see the individual pixels without even trying, it doesn't look good at all. If I want to see something small on the screen, I can't just look closer, I have to actually zoom in. I would also choose an OLED tv over a 4K LCD anyday but you are only picking out the points which are beneficial to you and ignoring the rest. For example I often use my screen for displaying images, I don't always want to have to zoom in to see detail, it's easier to look closer, checking a photo for sharpness is a nightmare. It is true that current hull hd dispays meet or exceed the retina level for normal viewing distances but retina is not enough so the argument is flawed. Pixels do not simply need to be small enough to be impossible to perceive, they need to be small enough to consistently display the smallest details we can perceive with high contrast, this means that pixels have to be significantly smaller than the smallest details we can see. Personally i do think 1.5 retina is extremely good and nearly indistiguishable from infinite resolution for most images but you need at least 2x retina and for many people 3x to be able to reach perfection and then only with accurate sharpening to compensate for the loss of contrast in fine detail still caused by the limited resolution. Yes, watching photos on a TV is a good point. Thanks for bringing that up. I still think most people use TVs for watching TV series and movies. Yes true, my argument only applies to a small percentage of the population. Anyhow, interesting article to ponder. I think that once the pixels become too small to see, that is the same point where the screen has reached as much detail as the eye can see, especially with moving imagery (well in my experience from cellphones atleast). Unless the TV uses large spaces between the pixels, I've seen that before and it definately lowers image quality even in high resolution screens. Even given that real Ultra-HD content is almost unavailable currently, Ultra-HD displays finally make it possible to view Full-HD videos on (getting more and more popular) passive-3D TVs (e.g. LG Cinema 3D) without loss of vertical resolution. Also, 4x more pixels potentially mean less noticeable/annoying Vcom-/dot-inversion-related flickering of sibling pixels/subpixels which is a most horrible “feature” of LCD-display technology in general (OLED should not have such flickering at all. For me, that’s the most important OLED benefit by the way). Also, I agree with revetahw that not-seeing individual pixels is not enough measure of perceivable resolution. After all, until you can’t see the difference between a real-life object and one displayed on a display, the display resolution is not high enough regardless of whether you see individual pixels or not; and Full HD TVs are definitely far from such level of detail. Finally, while I would prefer Full-HD OLED over Ultra-HD LCD, it seems that Ultra HD LCD monitors of reasonable sizes (for me, 24" would be optimal) and prices will became available much sooner than OLED ones. While I simply cannot judge any possible health aspect of 4k for graphic designers or others who work in front of the screen all day, I doubt that this aspect will factor into whether 4k will be a commercial success or not. Let's face it: Both 4k and OLED are aimed at your average TV owner who uses the TV to watch movies, sports and play video games. Professional users (for whom your argument might be a draw) make up a miniscule percentage of TV sales so I doubt they will affect the outcome. These so called experts seem to think the "in thing" to do is to all jump on the same band wagon and say that you can't tell the differance between 4K and 1080P TVs in a 55" TV and smaller. If this is true than why is everyone saying how much nicer the video quality is on the new iPads and other small devices? And some people see better than others. Plus, I for one, sit closer to the TV as the resolution of the TVs gets better, so I can get a more of a big screen movie expereance, I would suggest everyone should go to a show room and do their own side by side comparison and deside for them selves. These so called experts all parrot each other on the virtues of plasma. If plasma was really that much better you wouldn't need test equipment to see the differance and plasma sales would not be in the dumper, no one is buying them. I suspect they have better black levels because the plasma screens are darker to begin with, not good. Everyone should read what the "experts" say, get informed from differant sources, and then everyone should go to a high end A/V store and do side by side comparisons and decide for yourself. My own personal opinion is that alot of these so called experts are emotionally invested in Plasma technology over the years and it is hard for them to let go even as it is a dead technology. And I have seen a Plasma Kuro, too dark a picture, was not at all impressed. Go look for your self. I've seen the Samsung curved oled screen and Sony's 4k display in John Lewis in Notingham which surprised me. I saw the oled screen first, absolutely stunning colour, led cannot get anywhere near the richness and depth of old colour on a big oled screen. 'Side by side mode' and 3d where terrible for a display costing seven grand, but on 1080p source material my god oled is another level above led. After looking at the display for a while I said "thats great but I'd rather have 4k" (the view I held before seeing both with my own eyes). At that point is demo bloke said "really? There's a demo of the Sony 4k display behind our stand". So I checked it out. The extra pixels are great, Never seen such a detailed picture, but the screen looks more 'washed out' than Samsung oled (its the best lcd I've ever seen, but just can't compete with oled). For a TV on a wall I'd go with 1080p oled over led 4k without a single doubt now. I had to truely eat my own words, in John Lewis to a Samsung demo guy! If however you are after a high end 30" pc/mac monitor I'd still go with a korean 4k lcd display. At normal monitor viewing distance the higher dpi is far more worth it. If only someone could make a 4k oled 24" or 27" display, it would be my preference for a monitor as well as a tv too. Why shoot down evolving technology? Why argue about the negatives of 4k? yea sure it'll require more storage, processing power, etc. But why go against that? That can only mean that computers capable of natively supporting that can or will exist! Effectively allowing the potential for pocket sized super computers, remember the time when 3d gaming was only starting off? What came out of a simple luxury of playing a fantasy on a computer? GPUs? Which are now used in medical science and engineering! And eventually spawned the HPC cards! That are basically useless to the common user, but have paved the way to more amazing things than we thought possible. Think about it! The day we can create a monitor 21" in size and capable of some madness struck specs: 16 trillion by 9 trillion pixels at 30Ghz frame rate, with a color display ability of all 389 Trillion colors (Including UV)! and a response rate of literally 0. The computers needed for something like that would make TITAN look like a calculator. Pet AI anyone? Cure for Every Pathogen imaginable? Reversible Body Mods? Just think of the possibilities of that kind of Raw computing power! Onto the memory complain, remember the days when 3 Megs was overkill, now 3 Megs is more than a joke! We have 300TB HDD coming our way! With that kind of tech, forget 4k, I want 8k media! With the existence of 4k that just means we are closer to being able to use Gigapixel cameras which are basically exclusive to satellite and military only, and anyone raring to shell out $80k for a single camera. I’d like a gigapixel camera. Remember, it all starts with these seemingly useless luxuries. I don't care if my eyes can't see the difference, just knowing that my computer can handle that excites me! And have you seen the new 4k capable laptops? If people like you shoot down advancing technology that is basically useless to the standard person, that only allows cloud computing and other remote forms of computers to evolve, effectively making our own personal computers laughably pathetic! I don't want to have to pay to use someone else’s computer; I want my own computer to do the work for me! So when the internet is down, I don't have to worry, when money is low, I don't have to worry! Tell me, what happens when internet data rates achieves 50GB up and Down speeds with 0 ping? and everything else stayed the same? Computers will literally stop evolving because everything will be done in the cloud, there is no more need for better screens, better speakers, better CPUs, better anything! With everyones computers incappable of nothing more than being relays, how can indie software engineer even attempt their dreams, or Digital Artist? Even medical tech will halt! I don't rely on the internet, I rely on my computer and my computer alone! Better monitor means faster GPU and CPU and faster and more RAM, and Bigger and faster HDD! Newer standard that is 4x better than the current standard means improvement! We are getting better! Regardless of how useless it may be! Your main argument as to why you think 4k is worthless is because you say we can't see individual pixels from a normal viewing distance. And you're right, I couldn't pick out an individual pixel on even a 720p display from even 5 feet away (I own one and use it as a secondary 32" PC monitor). But what you're missing is the incredible amount of detail 4k adds to an image. The images are much more sharp and crisp and are in fact less blurry than any other displays on the market that I've seen. Why, you ask? Because even though I can't see individual pixels, they're there, and they're adding detail, sharpening edges and showing speckles of [whatever] that wouldn't be seen, or would be shown as a blur on lower resolution displays. I understand you're biased but your reasoning is crap. How about a 4k OLED display? Makes you happy, makes everyone else sick of blurry content happy. Have you ever SEEN a 4k TV next to a 1080P display? I have. I check them out all the time at best buy and in malls, wherever I get a chance. And you don't have to be 3 inches away from the screen to tell the difference. We were actually at best buy about a month ago and my girlfriend pointed out a TV from probably 10-15 feet away and said something along the lines of "holy crap, that TV looks awesome!" Then we walked up to it (a 55-incher, I think) at a decent distance (probably about 7 or 8 feet away), and she and I both were in awe. We took a few steps closer and before even looking at the sign I knew it was a 4K display. We then walked over and checked out a 50 inch FHD display that had its own little section (apparently the one with the best and newest tech) and her response was something along the lines of "wow, you never really notice how bad our tv's look until you see something better! This is terrible!" So I challenge you, sir: To find yourself the BEST OLED TV you can, and set it up next to any sub-par 4k display, and I bet you'll find yourself second guessing whether it really matters if we can see INDIVIDUAL pixels or not. 1 pixel doesn't make an image, the combination of many do. And the more detail, the better the image, at any distance worth sitting at. Also, you should be embracing the oncoming of 4k, because then you can zoom in on the image 4x and see all of that extra detail in your old favorite resolution, that wouldn't be there otherwise. Credibility? Gone. Perhaps the debate will be rendered "moot". Or did you really mean "mute"? ID hate to think the enhanced picture means that I would have no sound.